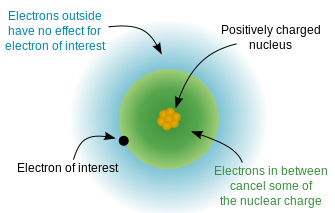 Effective Nuclear Charge: the positive charge of the nucleus that is felt by surrounding electrons of the same atom. Proceeding ↓ the group, then the “n” or # of shells increases. The more shells, the greater the distance between the nucleus and electrons, and the less of the magnetic force of the positive nucleus they will feel. That is a ↓ in Zeff. From left to right, atomic # (# of protons) increases, while shell # (distance between nucleus and outermost electrons) remains the same. More protons increase the positivity of the nucleus and it’s attractive force, thus ↑ Zeff.